Harold Camping, owner of the Family Radio Network who has set the date for the Lord's return at May 21, 2011, is a former engineer, and as such, he loves to play with numbers. They are an obsession with him. Now, since the number 5 stands for atonement (Says who?) and 10 stands for perfection (Since when?) and 17 stands for Heaven (Give me a break! ), this formula means, "Atonement has been completed for Heaven," and it is repeated twice for emphasis. 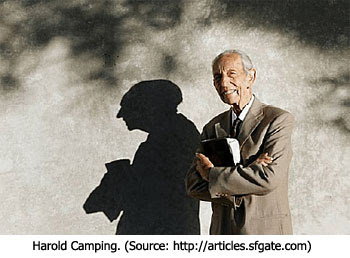 In the next part of this series examining the madness of Harold Camping's date-setting, we'll look at the Bible verses that ultimately challenge Camping's set date. I was at a retreat and a lady mentioned something about not wanting to hear about it and I asked why if approximately 25% of the Bible is about it, how can you just ignore it? But sadly the church I attended for years had a pastor that said he had no reason to preach on it because until the Word had been preached to all the world, we didn't need to be concerned with it. When he taught Revelations, it was approached to learn how to worship only. I was so saddened by that attitude. The church I am in now is warning people that the time is short and we have to be ready... I am very pleased about that! We can't ignore the warnings just because it makes us uncomfortable. And besides, we are to be waiting and watching for the bridegroom and the wedding of the church and the wedding feast and that is not a scary event! It depends on what is your focus... we need our eyes on Jesus. c in Salem...don't get me started ...let's just say that's just one of the many reasons (excuses).